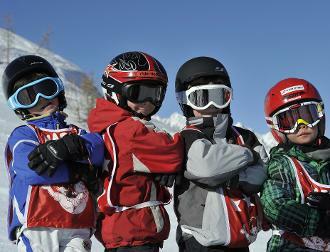 If your child is a beginner or wishes to learn safely at his own pace, the ESF Porté Puy Morens offers ski lessons for the little ones. Whether your child wants to perfect his style or simply to be accompanied in this new skiing experience, our instructors will do their best to adapt themselves to your child’s level to make it quickly improve. Throughout the week, our ski instructors will supervise your children and teach them how to ski in a relaxed and fun atmosphere. Your children will be able to learn quicker as all lessons take place in a playful manner. Let the fun begin! * Only for Étoile de Bronze, Étoile d'Or and Compétition. Please note that your child is not insured by the ESF! Think about subscribing to an insurance !